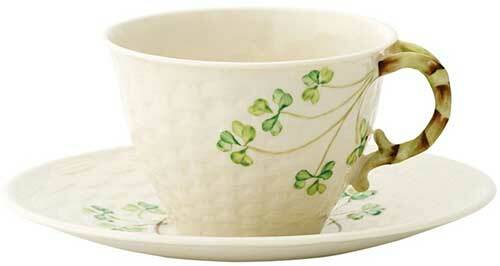 This piece of Belleek dinnerware is a fine china Irish teacup and saucer that is enhanced with shamrocks. The Belleek teacup and saucer features an embossed basket weave motif along with hand painted green shamrocks along with an embellished cup handle. The Belleek teacup measures 4 1/2" wide x 2 3/4" tall with the saucer measuring 6 1/2" diameter; both are made of fine china. The Belleek cup and saucer is safe to use in the dishwasher and microwave oven. This is the classic Belleek teapot that features hand painted shamrocks on fine china.